Editor's note: Sterlin Johnson is one of four recipients of the Sundance Institute's Roger Ebert Fellowship for Film Criticism for 2014. The scholarship meant he participated in the Indiewire | Sundance Institute Fellowship for Film Criticism, a workshop at the Sundance Film Festival for aspiring film critics started by Eric Kohn, the chief film critic and senior editor of Indiewire. Growing up on the west side of Chicago, I didn’t get out very much. My parents took me to a charter school up north, and when I came outside kids made fun of the way I spoke. When I would tell kids from my charter school where I was from, they wouldn’t believe me, and call me "oreo." I didn’t "act black," and I could never understand what that meant. And when I tried to act like the rest of them, it always backfired. I felt like an outcast, a geek, and I would sit inside and watch movies instead of go outside to hang out with the other kids in the neighborhood. My family had a lot of African-American films, and some nights, my family would get a new movie, order food and we would gather around the TV to watch them. One of my favorites was "Brown Sugar." It was a film about two best friends who bond over hip-hop, and eventually fall in love. While I was far too young to truly resonate with the film’s message, I loved the incorporation of hip-hop, and how the characters felt just as authentic as the music itself. They weren’t racial characters that populated the "hood" films that the other kids in the neighborhood loved. The characters were just passionate fans with a message that was ahead of its time. When I got older, I learned the name Rick Famuyiwa while searching the director for "Brown Sugar." I was surprised to find out he had written one of my favorite films at the time, "Talk to Me," and, from then on, I followed his career. When planning out my career as an filmmaker, I looked to him as an inspiration, and wanted to follow in his footsteps. Debuting at Sundance almost 20 years ago with his 12-minute short film, "Blacktop Lingo," Rick Famuyiwa has grown to be one of the most relevant African-American filmmakers in the industry. "Dope," Famuyiwa’s latest film, is his fourth directorial effort, debuting at Sundance 2015 and not only one of the highlights of the festival but perhaps his best effort to date. It is the story of an African-American boy growing up in a bad neighborhood, misunderstood because he chooses to be educated and appreciate things that aren’t considered "black." It felt like my life was playing out before my eyes, as I immediately attached to Malcolm, the protagonist. When I sat down to talk with Famuyiwa in Park City, it was revealed that he too was considered a geek. "I was into a lot of different things. I didn't fit in," he said. "I'm not a conformist. When you're not a conformist, you're called a geek or a nerd, or weird." It was this upbringing that helped develop his voice as an artist. "Blacktop Lingo" lead to him writing the screenplay for "The Wood" and sending it to the Sundance Institute to be workshopped. The film centered on friends bonding hours before a wedding. He would go on to explore romance, relationships, and marriage further in "Brown Sugar" and "Our Family Wedding." "I never intended to have weddings and marriage become my theme. It's just one of those things where you have initial success with something that continues to come and go your way," he says. "While I wanted to tackle relationships and what that meant, I felt like by the time I made my third wedding themed movie ('Our Family Wedding'), I wasn't expressing myself the way I wanted to anymore. I got so far off the course of what I wanted to do, that this was something I was really passionate about doing no matter what, even if that meant doing it independently." While "Our Family Wedding" wasn’t as well received as his previous work, it lead him to returning to his roots and set "Dope" in his hometown of Inglewood. 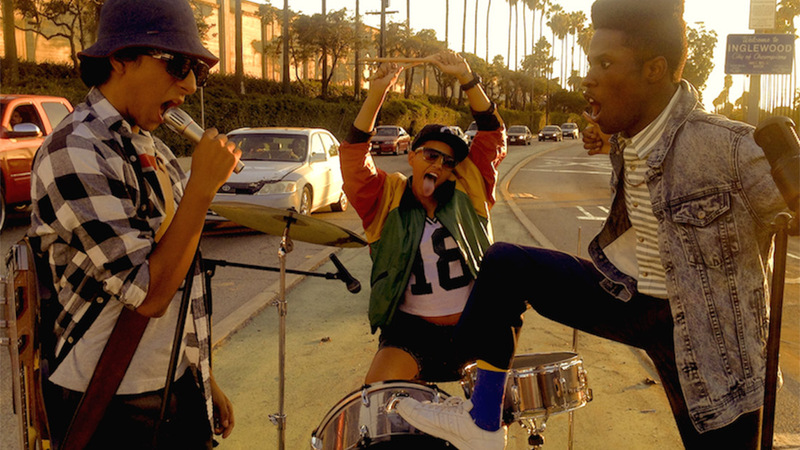 "Dope" is also a departure from the standard studio system to which Famuyiwa has been accustomed. "To me, this feels more like 'Blacktop Lingo' more than anything else, because when I wrote that, no one had never seen characters like that before, even on that small screen. I wanted to bring back the honesty and what that is. That's why I wanted to return to Inglewood. I felt like that was the place to rediscover my voice." While trying to find his voice, Famuyiwa discovered a very different type of Inglewood that he grew up in. While he grew up in the golden age of hip-hop, there is a new crop of artists that shape the mindset of the audience, and the element is very apparent in "Dope." Featuring appearances from A$AP Rocky and Casey Veggies, Famuyiwa uses the music to keep up with the times, and ground the film in realism. "That's where the idea came from: the music and listening to what these younger artists are getting into, I'm a huge fan of the A$AP Mob, Pro Era, and Odd Future, and Top Dawg (Entertainment) and all this stuff with what they are doing, and it's interesting for me to hear this new voice, but in very familiar places; so I wanted to pay homage to that voice that's happening now, revisiting my home town with a new point of view." With hip-hop being such a global movement, "Dope" exists in a time that it would be able to reach a bigger audience than that of "Brown Sugar," which came out in the early 2000s. "It’s been three different generations where we've been talking the same language, post-hip-hop," he said. "When hip-hop first exploded, everything was new, everything was exciting, and scary, and everything else. Then 30 years plus, hip-hop is the dominant artistic form and everyone knows that language; so that language is now spread around the world." It becomes abundantly clear when you see how well the audience handles the humor that would sometimes alienate people who don’t understand the language and meanings behind it. I remember walking out of the theater and seeing how diverse the audience was. Everyone laughed together, and it’s comforting to know that the message is still universal. "It's gratifying obviously to get the response that we've gotten this week. I wasn't really expecting any of it. I wrote it mainly for myself, selfishly," he laughed. "It was something I liked, and I thought it was cool. A lot of it's been tough, a lot of it's been pushing boundaries, and touching on things that a lot of people aren't comfortable talking about, and seeing and so I didn't know how anyone would react. So it is always gratifying when people feel it, but even if no one gets it, I'm fine. I made the film I wanted to make." Famuyiwa originally started trying to make films that relate to all audiences, but feature African-American characters. However, this story is very culturally-driven and doesn’t stray away from being specific. "What I wanted to say was more specific than what I had to say with "The Wood," which was very much about universality, and the common experience that would happen. I think this does too, but I wanted it to be very specific, I wanted a very specific kid and very specific things, because that should be embraced. It shouldn't be about watering [down] who are." Famuyiwa, who is a member of the Director’s Guild of America, has been a huge advocate for African-Americans in the film industry, and has dealt firsthand with studios who would rather make something purely ethnic, or water down his message in order for it to apply to one audience. This results in a lack of authenticity, and puts pressure on the filmmaker. "I feel like in the case of a film with black characters, and people of color, there's such a pressure for your film to speak for the entire race, because there are so few that come out, and they are so few and far in between, that when they do, then every film then becomes a new referendum on what it is to be black. I just wanted to tell this story." With a passion for storytelling, and with such a diverse background, "Dope" fits in perfect at Sundance, which is always looking for strong voices in film. "[From] my short I made almost twenty years ago to this crazy little film I've made now, its been a really interesting full circle for me to have started here, gone off and done a lot of studio work, had various challenges with that process, and getting to a point where I really want to get back what I really wanted to do and say. It probably took all that 20 years to discover it, but this felt like a culmination of a lot of things coming together that just felt right at this moment. I'm happy to be back and it’s been a great journey." While it's almost twenty years ago, the path as a filmmaker hasn’t changed much for Famuyiwa. "Each step, I thought it was going to get easier, I've just come to the point that it's going to be hard to live life as an artist. It’s going to be hard, I've just come to terms with that." The ability to do the film independently allows him to take risks when creating his film. "I feel like I'm doing stuff I've never done; I feel like I'm in the best control of my craft. So I'm excited to continue and see where I go. This was a real turning point for me, and what it meant for my career. I feel like, again, even with all the praise and success this week, it's going to be back to the grind, back to square one." While he plots his next move, Famuyiwa can bask in the success that is "Dope," which was picked up by Open Road Films and Sony Pictures and is due for a summer release. Full of laughs, technical brilliance, and a heartfelt, authentic story, the reinvigorated Famuyiwa has a promising career ahead of him, and shows no sign of slowing down.